My family lives in an old farmhouse. We love it’s character and charm. But as much as we love our house, the truth is older homes need more care and maintenance. Recently we decided it was time to replace the window in our laundry room. We had overlooked it for a long time while we focused on other projects around the house. But that window suddenly became a priority when I began to smell a musty odor while doing the laundry. It seemed like a pretty straight forward repair. Just take the old window out and put the new one in. We thought it would take a day or a weekend at most. But when we got the darn thing out we realized that our little project had suddenly become a major renovation. We had put off the repair for far too long and the damage was extensive. The entire exterior wall would need to come down so it could be reframed and rebuilt. It was a huge undertaking! Once the wall was finally down, we could see exactly where the problem had started. The foundation of the wall, the 2×4 footer board, was completely rotted and had been reduced to sawdust. I could see straight through the board on either side! It was a pitiful sight and really it’s a wonder that that the wall didn’t fall down all by itself. I felt like I was on one of those house flipping shows where nothing goes right. It was a hopeless feeling standing there staring at a huge gaping opening into our house. And to be perfectly honest the idea of sleeping in a house with one wall missing was a little bit scary. But until the foundation of the wall was rebuilt we couldn’t close up the rest of the wall and feel safe in our own home. We had neglected our laundry room wall to the point that it was built on sand. 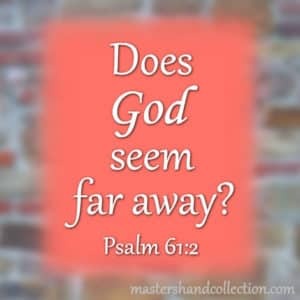 And as I stood there contemplating the deteriorated wall and the huge gaping hole that had become our house, I was reminded of these words of Jesus. Just like our laundry room wall, sometimes our lives need to be rebuilt too. It’s easy to become distracted by everything we have to do. 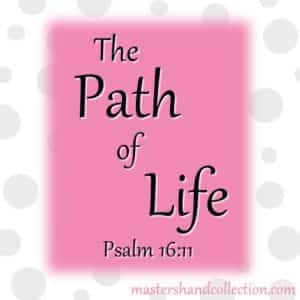 And it’s easy to veer off the path God has for us. We keep going and going until one day we realize we’ve neglected our relationship with Jesus and somehow we’ve built our spiritual house on sand. We didn’t mean for it to happen, it just did. But if you find that you have built your house on sinking sand, don’t be discouraged. We’ve all been there. And we’ve all had to rebuild our house from time to time, (myself included). So how can we rebuild our home on the rock instead of sand? Jesus said that those who hear His words and do them will be like the wise man that built his house on the rock. That means if we put our faith in Jesus, pray, read the Bible and then actually follow through and do what He says, we will be founded on the rock. It sounds simple and really it is, but I know that hopeless feeling of being in a place you never intended to be and thinking that there is no way out. I have been in the sinking sand of life, in a house of my own making. But I want to encourage you…Don’t be afraid to turn around and go back to the basics. 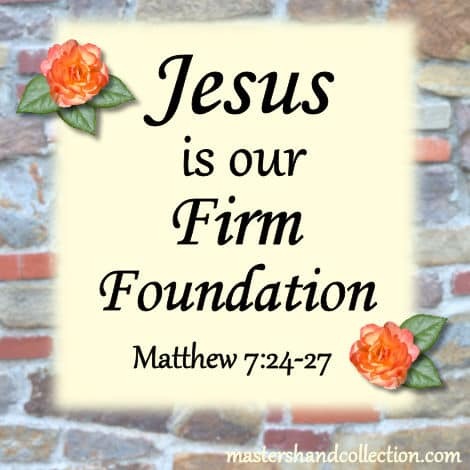 Jesus is our firm foundation! 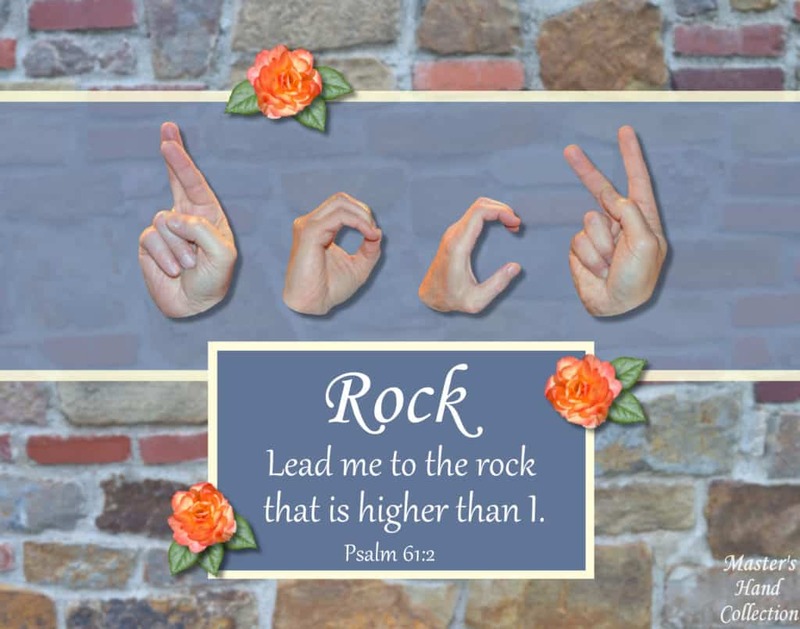 He is our rock! When we build our foundation on the truth of Jesus and who He is, then we are on unshakable ground. When the storms of life rage all around us we will not fall down. He will keep us from sinking. Because there is no storm too great and no circumstance too big for Jesus to overcome. I read a bit of wisdom recently that I would like to share with you. It has so much simple truth within it, it took me by surprise. Don’t be in crisis, be in Christ! Wow! That really blew me away! It seems that we all live in a state of crisis. But we don’t have to. When the storms of life threaten to knock us down, we can put a stop to the crisis by building our house on the rock right now. We don’t even have to wait for the mortgage to go through, our house has already been bought and paid for by the blood of Christ. We can simply be in Him! If your heart is overwhelmed, cry out to God and allow yourself to be lead to the Rock. No matter what you are going through right now, Jesus will be your firm foundation and your unshakable ground. May God bless you as you stand on the rock that is higher! Yes, we can always remodel and rebuild, can’t we? Hi Rebecca! Yes, we can! So glad you could stop by today. Thank you and God bless you!